Martin Guitars, The pioneers in guitar manufacturing brings you high quality guitars at great prices. Browse to see the amazing range of instruments we offer. Give us a call or inquire online. Martin pioneered the Dreadnought - named after a battleship of all things - no doubt because of its big booming presence, the Martin flagship guitar model is the D28. Come visit our awesome guitar room to try out the world’s most famous acoustic brand - C.F.Martin & Co. If we don't have your choice of Martin Guitar in stock please ask, we will happily order it in for you. Our guitar specialist Ed Castelow takes you through the ins and outs of a different model each week (or two...) with the control of the 'Guitar of the Week' theme tune. Imagine all the songs that you could play on this. I’ll give you some truth about this model, it’s a D-28 with a few spec changes and additions. The solid Sitka spruce top is enhanced with Martin’s VTS (Vintage Tone System) and the X-bracing is rearward shifted making for tight bass response. Peace sign inlay on the back and adorned with Lennon self-portrait headstock and Lennon inspired fret inlays. Harking back to the orginal classic Orchestra Model with it’s solid Sitka spruce top with aging toner and bold herringbone trim. Also equipped with a Fishman Aura VT Enhance pick up system so you can take on the stages and not just the living room. NOW (an Ed special) $5,895. The Performing Artist series of guitars are renowned for being easy to play instrument with a tapered neck shape (despite its 1 ¾” nut width) and integrating swish electronics from Fishman. This model is at the top of the heap with a solid Sitka spruce top and solid East Indian rosewood back n’ sides, not to mention a pickup that actually has aural images of classic microphones! What the? Discontinued model. Dreadnought with a modern twist. Part of the new Americana Series, which focuses on American tone woods it features solid Sitka spruce on the top and solid sycamore on the back and sides. It doesn’t end there either as this guitar has the width of a 000 instead of a dreadnought and features a silver binding with tasteful orange pinstripe. Brand new for 2017 and part of the Americana 16 Series, this Orchestra Model focuses on the use of FSC Certified American tone woods to create a great new voice! Modern design features include Fishman Matrix VT Enhance pick up system, Schaller GrandTune machine heads, silver acrylic binding and heel plate. The 16 Series has never looked so good! Re-imagined for 2018 with vintage appointments like aging toner, antique white binding, open back tuners and the old style script logo on the headstock this Martin classic has never looked so good! Now with “forward shifted, scalloped bracing” this stone cold classic sure nows how to rumble. Designed by Martin CEO Chris Martin, the CEO-7 is a smaller sized acoustic with a big sound. Solid adirondak spruce top and solid mahogany back and sides. Originally fashioned in 1965 out of neccessity from the "seconds pile" of Brazilian rosewood, this three piece backed dreadnought has a voice of it's own thanks to it's solid sitka spruce top, custom bracing techniques and that great looking three piece back; these days made from East Indian rosewood. Potentially the best of both worlds by having 000 body shape but with a 25.4” scale length the OM-21 hits all the right notes. Solid Sitka spruce, solid East Indian rosewood back and sides, ebony fingerboard and bridge. The tone that this has belies it’s simple look. An OM-28 without the flashy bits. Limited to only 300 WORLDWIDE! 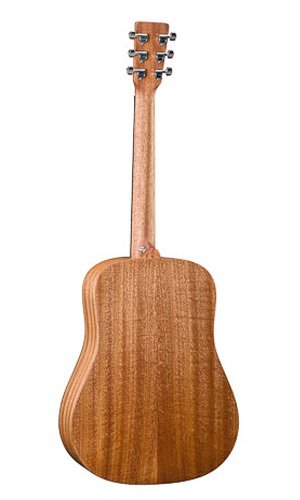 This special edition guitar has certain features not seen on other Martin guitars, East Indian Rosewood is used on the back, sides and fingerboard for instance. Understated back binding frames the solid Sitka spruce top. Pick up a piece of Martin history! Perfect for the gigging musician this dreadnought has a high performances tapered neck and Fishman's F1 Analog pick up system. Solid sitka spruce top and solid East Indian rosewood back and sides it's ready for the stage. Warm is an understatement when talking about the tone of this understated gem. Semi gloss finish, all solid mahogany Grand Performance body, vintage butter bean tuners and loaded with Fishman's Matrix VT Enhance pick up system. Certified woods make this OM the earth conscience choice. Solid spruce, solid cherry and katalox from Central America, work together in harmony for this build and the gold hardware gives it a regal touch. Want that vintage "depression era" look? Look no further! Designed to be affordable during tight times the 15 series is all solid Mahogany and this 00 size guitar is as warm as it is light. You'll be strumming for hours on the front porch. Designed with the younger player in mind, the Dreadnought Junior features a solid sitka spruce top and solid mahogany back and sides. As well as coming with a Fishman Sonitone pickup this guitar comes with a padded gig bag. 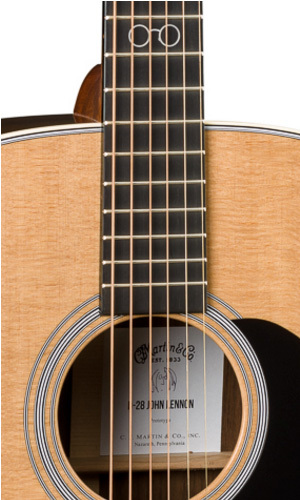 Part of Martin’s Road Series, this grand performer is an ALL solid wood Mexican made guitar. It comes with a hardcase and a lower price tag for those who are price sensitive. Still all solid Martin tone here folks with Sitka Spruce on the top and Mutenye back and sides. Comes with Fishman electrics. Part of the affordable X Series, this dreadnought size guitar spells quality that won't break the budget. Matte finished sitka spruce top and HPL back and sides, this guitar sounds better than most other all solid wood guitars above it's price point. Fitted with a Fishman Sonitone pickup. Do you like your left hand so much that you want to turn your guitar over and play it upside down? Don’t! Get a lefty! Here’s a fine example with a solid Sitka spruce top and rosewood grained HPL back and sides. Made by Martin in Mexico their X series is famed for being high tone/low cost. Fitted with a Fishman pick up. Part of the affordable X Series, this 000 size guitar spells quality that won't break the budget. Matte finished sitka spruce top and HPL back and sides, this guitar sounds better than most other all solid wood guitars above it's price point. Fitted with a Fishman Sonitone pickup. Small in size but not in tone, this 'travel sized' guitar has a solid sitka spruce top and mahogany HPL back and sides. Ideal for those on the move that can't be without a guitar.